My wife and I went on a hobbling stroll recently (I’m still recouping from the broken kneecap) and we walked over to the Sand Lake Cemetery, an old, (think mid 1800’s to present) small cemetery down the street. Who was Russell G. Woodward and why is humanity indebted to him? It turns out that Russell was an inventor of industrial sewing machines. Originally designed for making bags, (think seed, feed and more) he was instrumental in designing them to efficiently create apparel. Russell was an innovator, someone who used his head and hands; understood the mechanics of motion and how people worked. He knew what it was like to get investors, all the while investing time, energy and sweat in something he believed in. As with many innovators, one of his greatest breakthroughs came not while in the machine shop experimenting, but while relaxing, reading the Sunday paper. Leisurely thumbing through the paper afforded Woodward’s mind a chance to disengage from the sticky design problems he was struggling with, allowing concepts to swim around with each other unencumbered deep within his subconscious. The result of the synthesis was a technology to make the “safe-elastic-stitch”. The knit goods industry was transformed. I was, and still am, in a state of awe and melancholy. The aspirations and dreams of a man: his work, his family and his eternal resting place. It’s a reminder of who we are – each person making a difference. Stitches in fabric, connected through time and space, by love, by sharing ourselves with a passion and joy. Human nature in its essence. This Memorial Day, in addition to your loved ones that have passed on, remember those who make our lives better by sharing their innovations. And if you’re wearing machine stitched clothes, send a thought towards Lat: 42.415278 , Long: -88.050000 . The Pen *IS* Mightier Than the Keyboard! Langen and Velay– This is a GREAT article on writing and the haptic experience. 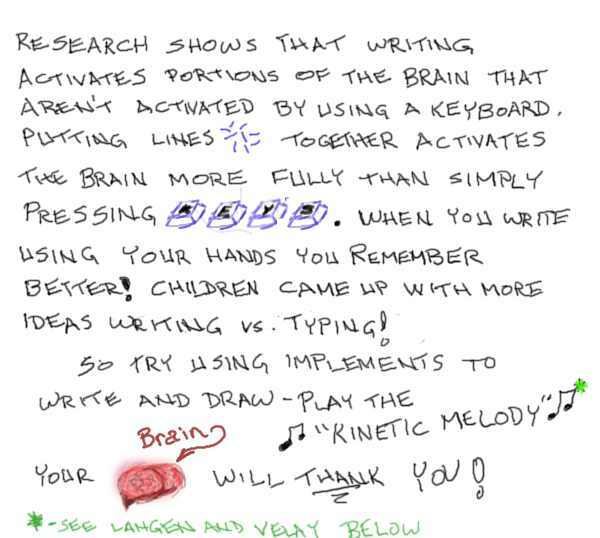 Two summaries worth reading: Better Learning Through Handwriting and How Handwriting Boosts the Brain. Where does good design come from? Is it a representation of who each of us is? If so, then surely self-awareness comes in to play? I came across this short reflection (Via Charlie Badenhop of Seishindo) by a Japanese architect who we know as Okamoto. From time to time I get to meet exceptional teachers in Japan. Often what happens is I go to visit a friend and it turns out that one of the other guests is a highly regarded sensei. Recently I had the opportunity to meet a man that works as an architect. Here is what Okamoto sensei had to say about his work. “Charlie-san, our host said you have an interest in architecture. She suggested I tell you about the concepts that influence my work, and thus I’ve taken some time to think about this topic. In Japanese culture, and particularly in Japanese architecture mushin is an important concept to understand. In relationship to my work, the two ideas I hold in regard to the meaning of mushin are “innocence” and “free from obstructive thinking”. I strive to make all my work as simple as possible, without any visual, emotional, or physical obstructions. What I’ve found over the years is, the simpler you make something, the more obvious the obstructions in your thinking appear. Rather than being bothered or constrained by the relationship between simplicity and obstruction, I find it very energizing. In the early stages of each new design, I look forward to discovering the weakness in my thinking. This leads me to understand I sometimes try to hide my weaknesses by obscuring them with complexity. The more simple the design, the less there is to hide behind. I must say that each time I discover this I am humbled. It’s only by being willing to own up to my many personal flaws, that I can little by little do away with the flaws in my designs. In both my personal and professional life, I attempt to discard all extraneous actions and thought. I strive to be economical, ecological, and graceful, and follow a path of least resistance and optimal effect. I’ve found that I am most likely to embody this way of being prior to reflecting on what I’m doing. At such times, which still only happen rarely for me, I’m in a state of open focus relaxation, and my thoughts and actions occur simultaneously. Nothing comes between my thoughts and my actions, and neither is anything left over, or left undone. When I’m able to embody such a state I feel better both physically and emotionally, and I consider my work to be a reflection of my soul. Sensei paused to make certain he still had my attention. “If you don’t mind,” he said, “let me please say one more thing, at the risk of filling the space with too many words. A door and windows are cut out from the walls, to form a room. It’s the emptiness that the walls, floor, and ceiling encompass, that allows for the space to live in. Thus what we gain is Something, yet it’s from the virtue of Nothing that this Something derives.? How many corporate cultures have complex innovation processes? What weaknesses are these complexities hiding? What weaknesses are complex User Interfaces hiding? Are these all reflections of the designer(s)? Powerful questions to ask and not for the faint of heart. ***Unless otherwise attributed, all material for the newsletter “Pure Heart, Simple Mind”™ is written and edited by Charlie Badenhop. If you would like to receive complimentary copies of future newsletters, please click on this link, http://www.seishindo.org/newsletters/ ©All rights reserved.